The Job Totals report shows the total number of jobs processed by the system over a specified period. The total number of jobs includes those that were cancelled by the operator and jobs that the driver ‘no showed’. 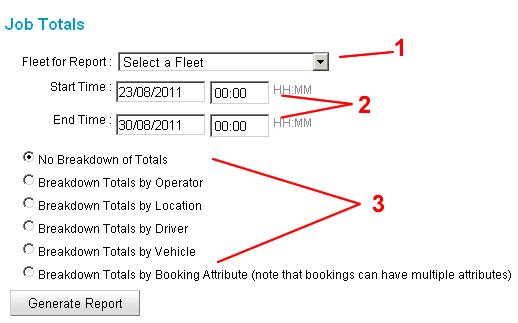 Select the fleet (1) and the start and end time for the report (2). Choose the type of breakdown you wish to see (3). 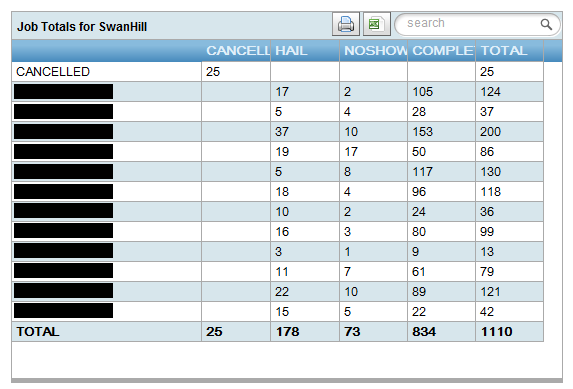 No Breakdown of Totals – shows the number of Completed, Hail, No Show and Cancelled jobs for the specified period. 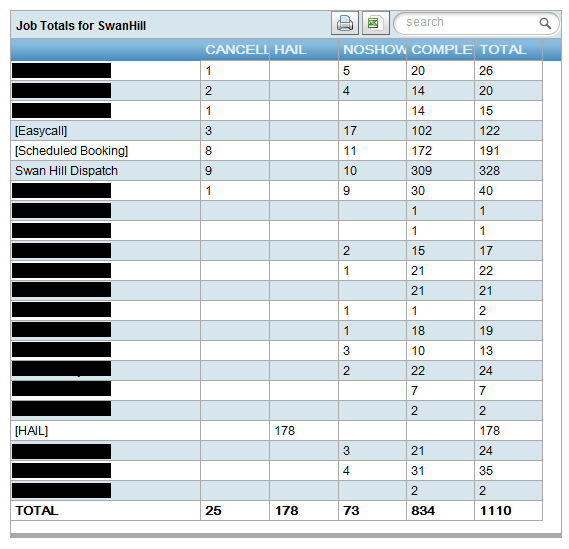 Breakdown Totals by Operator – shows the number of Completed, Hail, No Show and Cancelled jobs for the specified period, broken down by Operator. An operator may include a dispatch operator at a call centre or a web booking user. The report will also show special types of jobs and these are enclosed in square brackets ([HAIL], [EasyCall] and [Scheduled Bookings]). Totals by Location – shows the number of Completed, Hail, No Show and Cancelled jobs for the specified period, broken down by Location. In the example below, special types of jobs are enclosed in square brackets: [HAIL], [EasyCall] and [Scheduled Bookings]. The report also shows the jobs that were created by the call centre operators (NSW Country Taxi Call Centre Pty Ltd) and web bookings users (Taxi Cabs of Orange Co-operative Limited) located at Orange. Breakdown Totals by Driver – shows the number of Completed, Hail and No Show jobs for the specified period for each driver. The report also includes the total number of Cancelled bookings for the specified (so that the Total adds up). Breakdown Totals by Vehicle – shows the number of Completed, Hail and No Show jobs for the specified period for each vehicle. The report also includes the total number of Cancelled bookings for the specified period (so that the Total adds up). 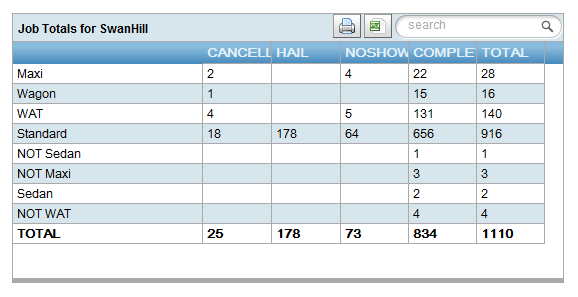 Breakdown Totals by Booking Attribute – shows the number Completed, Hail, No Show and Cancelled jobs for the specified period broken down by booking attribute. Note that the total may be more that what is displayed on the other reports because some bookings may have multiple attributes (e.g. Maxi + Capsule).